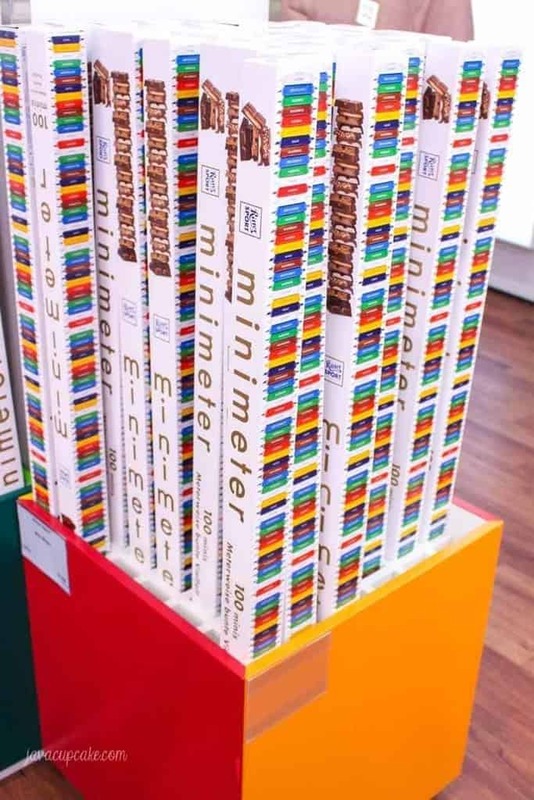 If you love chocolate and you’re in Europe you must take the time to visit the Ritter Sport Chocolate Factory, Museum and Store in Waldenbuch, Germany. It is a chocolate lovers paradise! 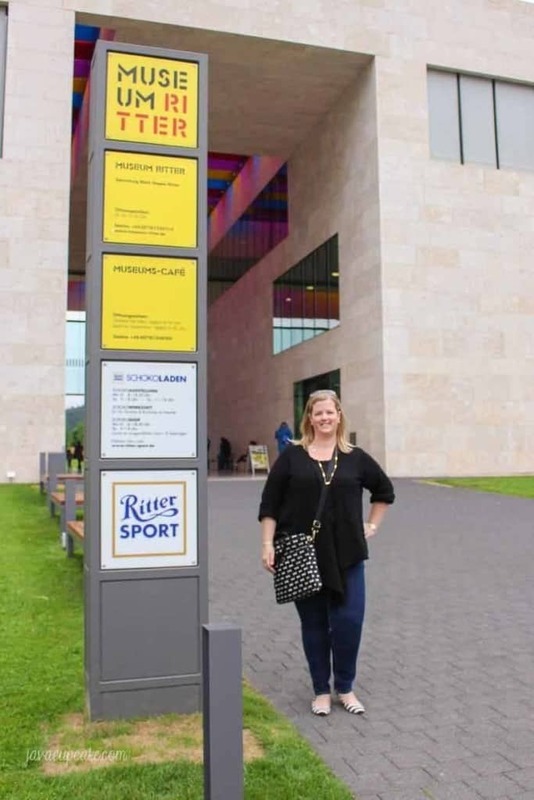 On my husband’s bucket-list of places to see before we leave Germany was the Ritter Sport Factory & Store in Waldenbuch, Germany. 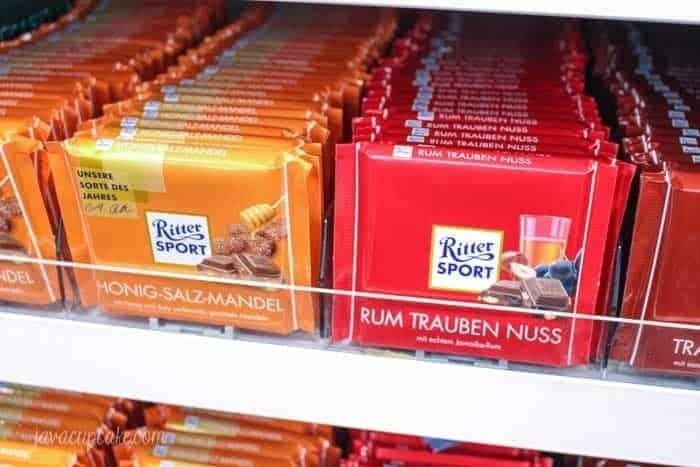 I went to the Ritter Sport store in Berlin a few years ago with friends, but my husband was deployed and couldn’t come. Boo. So, our family made sure to stop for a visit on our last vacation! 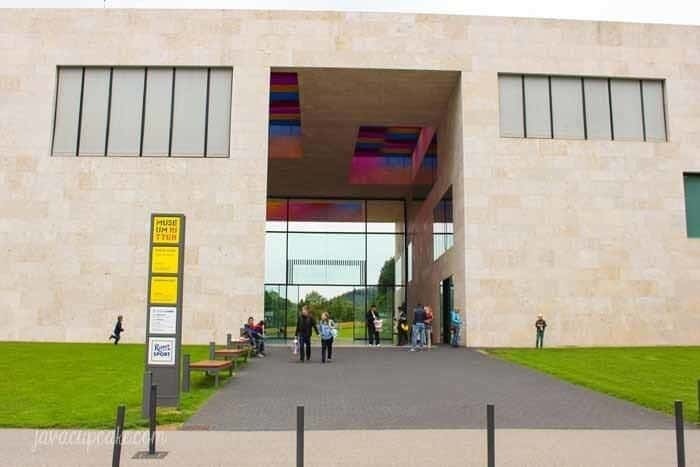 The Ritter Sport Factory has a beautiful art museum that is full of art inspired by the square. In the museum you’ll find Marli Hoppe-Ritter’s collection of contemporary geometric and abstract art in the museum building designed by the Swiss architect Max Dudler. * It’s fascinating and really quite fun to see so many bright colors and shapes. Matty, who is three, loved picking out the square shapes in the art and found all the bright colors fascinating to look at. I wasn’t allowed to take any pictures of the art, so you’ll just have to take my word for it! In addition to the museum, Ritter also has workshop for kids and a cafe. An experience for the entire family! 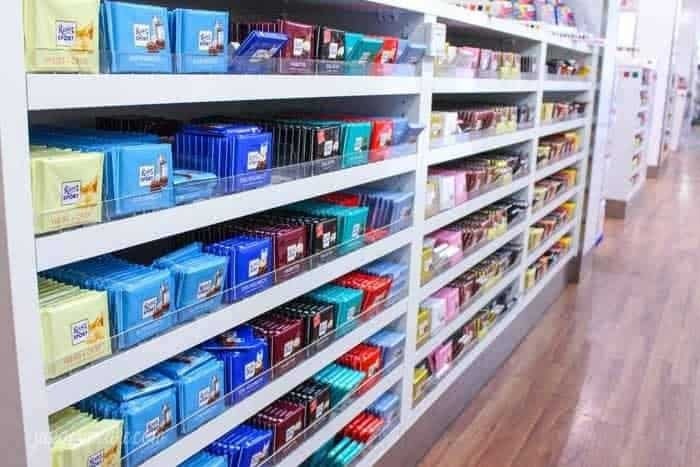 Upon walking into the Ritter Sport ChocoShop, I felt a rush of excitement and joy as I was surrounded by chocolate! It was overwhelming and exciting all at once and I couldn’t wait to explore the store. 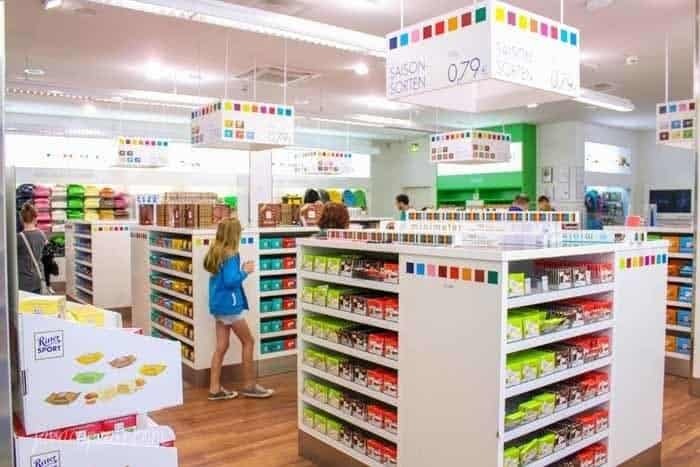 Shelves lined the store from wall to wall filled with every flavor of Ritter Sport chocolate you could ever imagine. Classic flavors like Alpenmilch (chocolate made with milk from cows raised in the German Alps) to adult flavors like Honig-Salz-Mandel (chocolate with honey, salt and almonds) and Rum Trauben Nuss (chocolate with rum, grapes, and hazelnuts). Chocolate as far as the eye could see. Around every corner was a new flavor to explore! 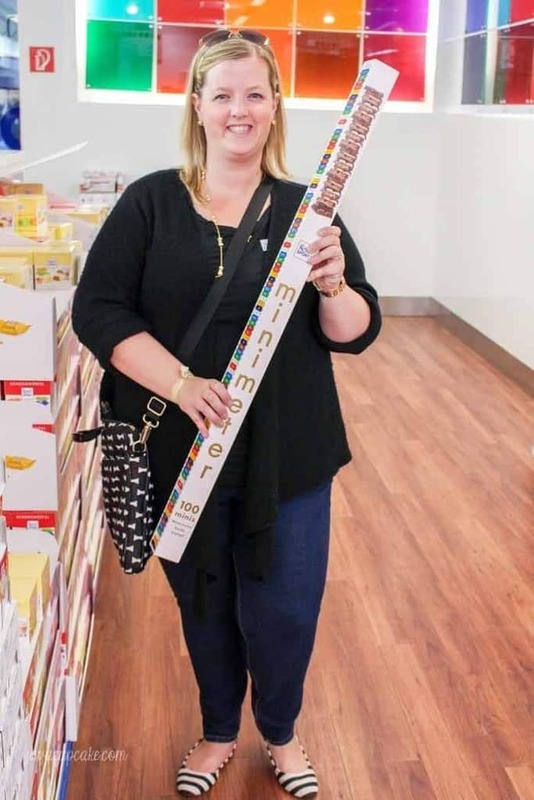 One of my favorite surprises in the store were the tall, thin boxes filled with chocolate squares reaching one meter long! An entire meter of chocolate! Oh my! Of course, I needed a photo-op with the meter-o-chocolate! HA! One of my favorite parts about the ChocoShop was the bright colors. Everywhere I turned it was a rainbow. 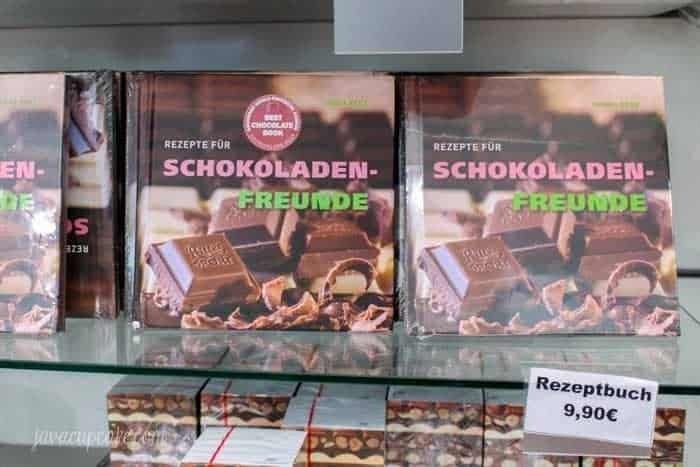 The store even had a cookbook full of recipes to make using Ritter Sport chocolate! I walked out of the store without buying this and I totally regret it! Tucked into the back of the store was a special room. The room that had everyone excited and frantic. The Reject Room. Well, that’s not the official name, but that’s what I called it because it was full of the chocolate that wasn’t good enough to sell in the store. The imperfect chocolate. The defect chocolate. The ugly chocolate. But really, do you care what your chocolate looks like when you eat it? I don’t. So… I bought a lot of chocolate from this room. It was SO CHEAP. Seriously. Pennies. I was in heaven. Blocks of 4 bars wrapped in paper just for me? Yes, please. I’ll take 3! 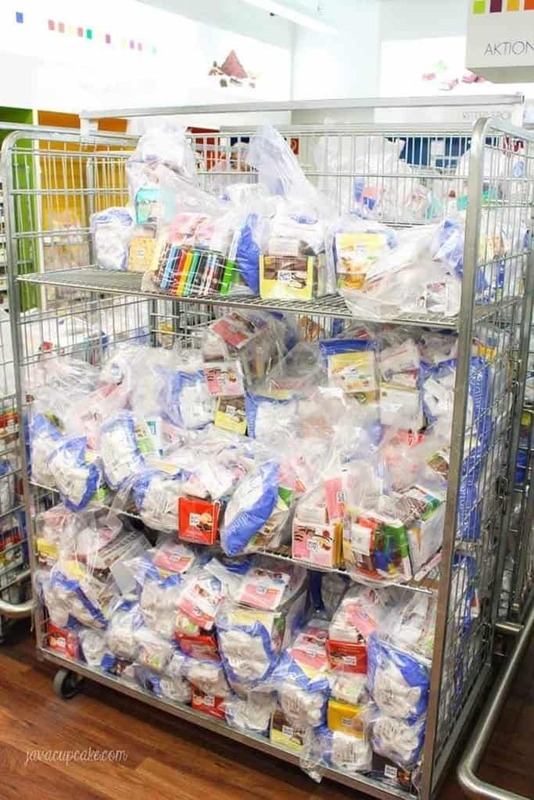 In this room was also chocolate sold in bulk. Bags and bags of bars of chocolate they just made too many of ready for me to take home and eat. Grab and go. 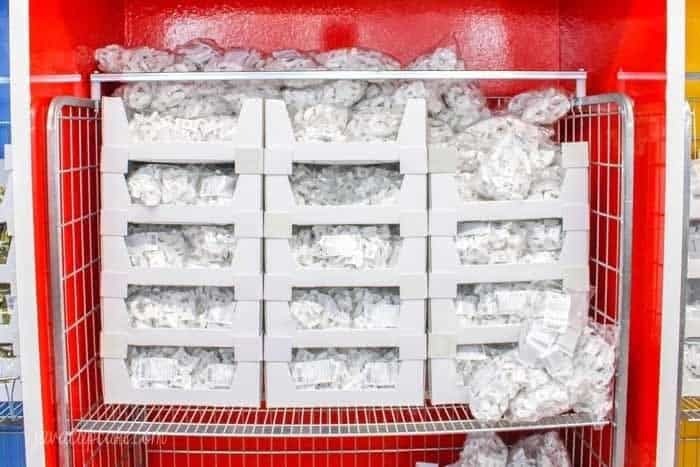 There were even bulk bags of the mini bars of chocolate. I can’t even. Seriously. What’s this? 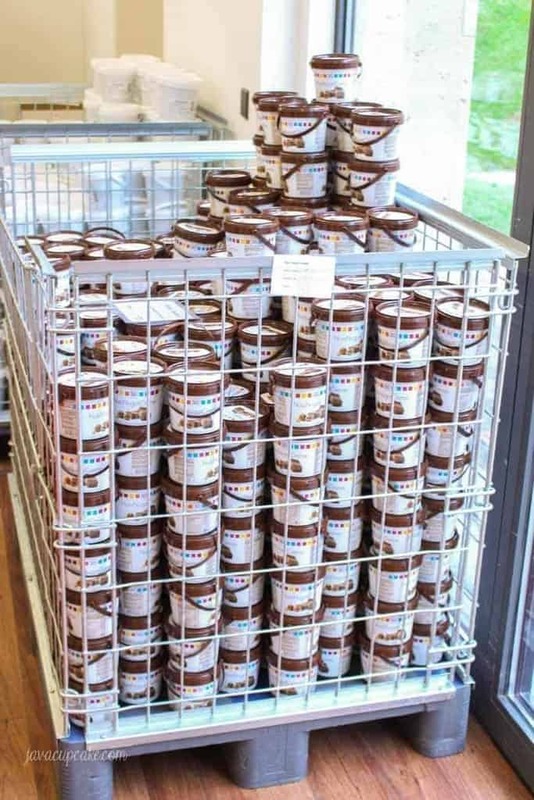 A huge basket full of tubs of hazelnut spread (aka the Ritter Sport version of Nutella). Yeah. Tubs for days. I could have bought all of those too. Wiesse Zimt Crisp. I mean white chocolate with cinnamon crispies inside. Have you ever heard of such deliciousness before? I seriously hope this become a staple Ritter Sport flavor because it was so incredibly delicious. Also in the test bar section was Schoko Brownie (chocolate brownie), Haselnuss (hazelnut), and Aprikose Holenderblute (apricot elderflower). My husband was in love with the elderflower bar as it was unlike anything he’d ever put in his mouth before. So good. We picked out as much chocolate as we thought we needed and went to the register to pay. All of this for only €20. We went back three more times to get more. Including this super cute tote bag. Living in Germany you tend to collect a lot of canvas bags. When I saw this one it went in my cart. Done deal. 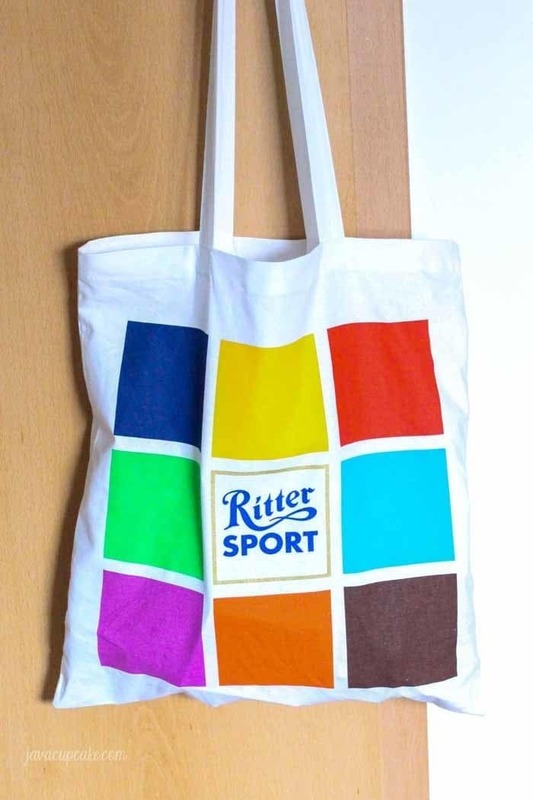 For more info about the Ritter Sport Factory, Museum and Store make sure to goto their website! So much info there to help you plan your trip! Admission to the museum is €6 for adults. See their website for more pricing info. 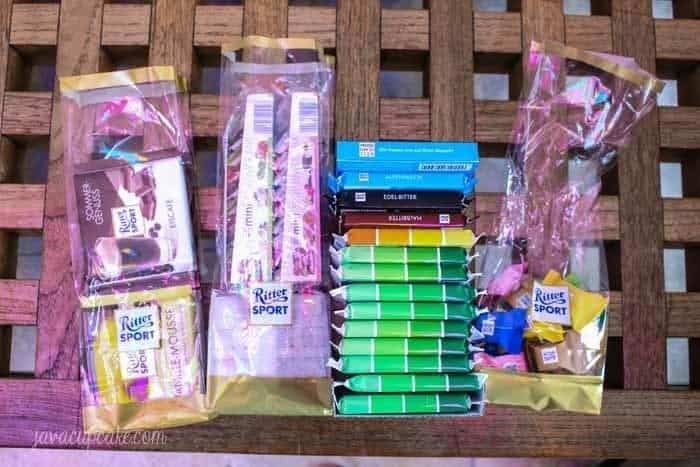 You know I wouldn’t goto the Ritter Sport ChocoShop without getting some for my readers! I picked up 8 test bars, 6 mini bars of my all time favorite Ritter chocolate Goldshatz and a 10 year anniversary bar. You won’t find any of these in the USA, that’s for sure! The test bars include 2 each of Weiss Zimt Crisp, Haselnuss, Schoko Brownie and Aprikose Holenderblute. The anniversary bar is a is a chocolate bar with crispies (knusper) and tortilla chips. Crazy, I know. Open to USA and Germany mailing addresses only. Fill out the entry form below. Winner will be chosen July 22, 2105. I have a cupboard full of the Honig-Salz mandel! Best ever! Love chocolates! Would love to win! The Schoko Brownie sounds Devine! 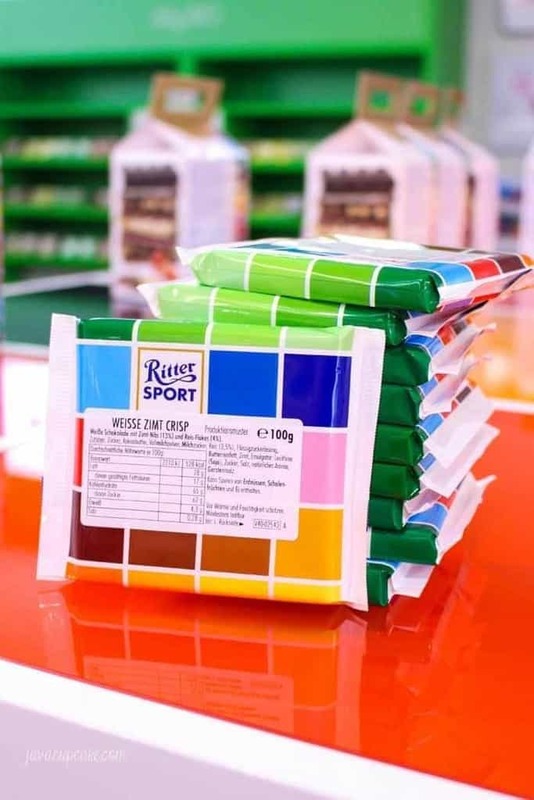 I LOVE Ritter Sport! But my favorite chocolate is milk chocolate from Switzerland. Like the kind they serve on SwissAir flights! You only need one little square for complete satisfaction! Yes! Swiss chocolate is amazing!! Oooh I would love to try out some of those tester bars. Elderflower is so yummy and the cinnamon crispies with white chocolate sound divine! I loved salted dark chocolate the best! I went to the Ritter store in Berlin! Loved making my own bar. Me too! They had the option to make your own bar at the Waldenbuch store, but it was by appointment only and for large groups of kids. I may try to make it up to Berlin one more time before we leave Germany just so my husband has a chance to make his own bar! So fun! I love dark chocolate with almonds!! I love chocolate, especially dark chocolate. 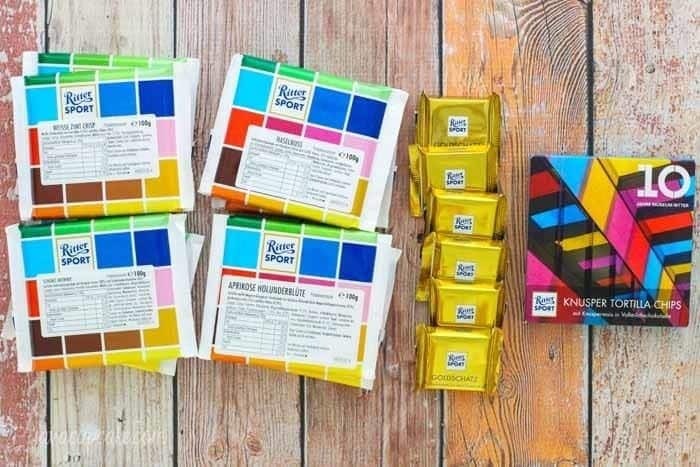 I would love to win a free sample of Ritter Sport chocolate. Oh my…what a store!!! My nieces would just flip! I would love to try the rum trauben nuss. WOW! That is amazing!! My fave chocolate is a good dark chocolate with almonds or dark with orange. Right now I’m really enjoying the Endangered Species line of chocolates. They’ve got such a great variety…blueberries, cranberries, cocoa nibs, coffee bean. I love them all! Oh my goodness! 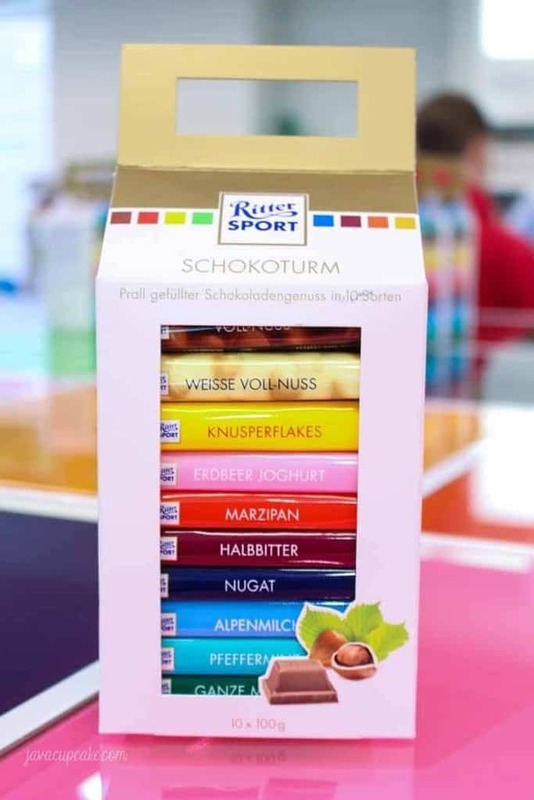 I adore Ritter Sport chocolate. My favorite is the cornflakes flavor. When you said that they make one with two of my favorite things, elder flower and apricot, I had to pinch myself. I hope I get to try it someday. I love Ritter Chocolate. I miss being able to get the Rum Raisin here in the states. I wish that I would of know of that museum when I lived there. It’s better than the crystal factory. Ritter Sport is my favorite brand of chocolate ever, but my favorite of theirs is a mixed berry yogurt in the middle of milk chocolate. So good! This museum and store looks amazing, I had a friend who went a few months ago and told me how cheap the chocolate was, completely jealous. Hope I make it there one day! Never had Ritter chocolate before so this would be awesome to win! I love any type of dark chocolate, not only to eat, but to bake with as well! ohhhh my yum!!! My brother is about to enlist in the airforce (cue tears) and if he ends up on the Germany base I’ll make sure to visit the ritter chocolate shop!!! Yaaaaaaaaaas!!!! If he makes it to Germany, the air base here is super close!! YAY! Chocolate & mint is my all time favorite candy. I love dark chocolate with hazelnut, chocolate with toffee, dark chocolate and coffee, dark chocolate and mint… well, um, yea, dark chocolate. LOVE Ritter chocolate. What a treat it will be to win it! Mmmmm yeah dark chocolate for the win… for sure. How about you just pick some of your favorite flavors and I’ll just run down to the store and get you some 😉 xoxox Email me the deets Kimmie!! Love chocolate! All varieties! My fave is dark chocolate with almonds. I would love to win this giveaway. Thanks, Betsy! I’ve been following you for a couple years now and I can say that A) I am jealous that you live in my favorite country. Visited friends in Nuremberg and seriously fell in love. B) you make the most delicious treats. 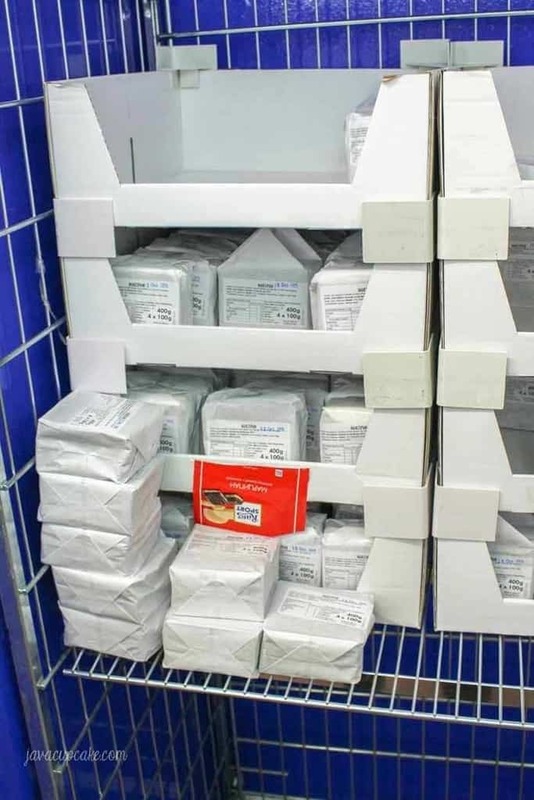 And now you went to a Ritter sport factory. I’ve tried several flavors of Ritter and it’s hard to pick one. But the one that stands out most is the raisin and hazelnut. Amazing!!!!! Hi Sarah <3 Thanks for reading for so long! I'm so happy that you've stuck around for all the fun! We go to Nberg often... it's our go-to when we need a big city fix since it's only about 45 minutes away from us. LOVE it here! In fact... I think I need to plan another trip there soon! hehe Thanks again for reading! LOVE the dark chocolate with whole hazelnuts. Your site is one of my go to places for cupcake recipes. I love any type of chocolate. My favorite would be chocolate and hazelnut! OMG!!! 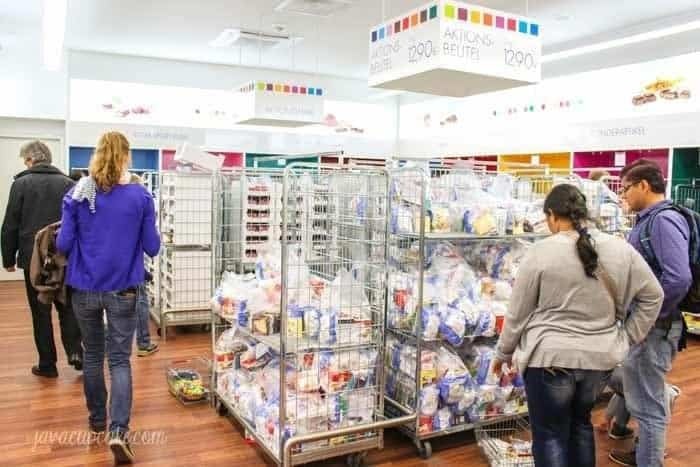 What an amazing experience…I’m so jealous of your shopping trip! Would love to win!!! I love anything chocolate and peppermint!!! Delicious!!!!! This makes me want to come back to Germany, just to go to the Ritter factory! I love the Ritter with the biscuit! I’m a total chocoholic, but I’d have to say milk chocolate is my favorite! Yeah, dark chocolate is better for you…(natch)..and I like it a lot too. But the milk….heaven! Thanks for the chance to win. LOVE LOVE LOVE this chocolate! Would love to ramp up my cupboard before the holiday baking season starts for me. Thanks for sharing info on the store. It looks really cool!!! Hi I was wondering if you could share on how to get to the factory. Cos I checked on the map it seems like the place is middle of nowhere of some sort. What sort of public transportation is accessible there besides taxi ? If I were to come from Tegel Berlin aiport that is. Thank you. Hi June – I’m not sure what public transportation goes out there to the factory. I know that you could probably take a DB train to the general area and then possibly take a bus to the factory. You’d have to research that though because I don’t know all the ins and outs of the public transportation in Germany… I usually drive everywhere. 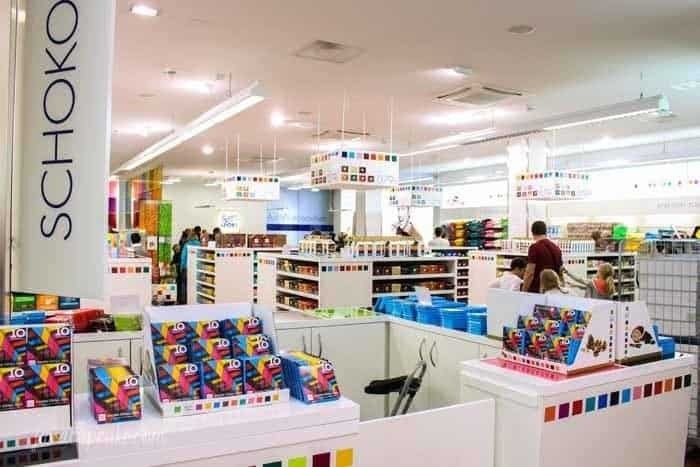 If you can’t make it out to the factory, there is a super cool Ritter Sport retail store in Berlin where you can make your own chocolate bars!